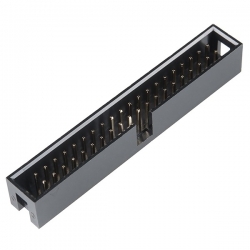 These box headers are a dual row shrouded header for use with dual row IDC female socket connectors. Has the same number and spacing of pins as the Raspberry Pi B+ so you can easily connect up using a ribbon cable. The low profile, space saving design has a centre slot for the socket''s polarization bump.